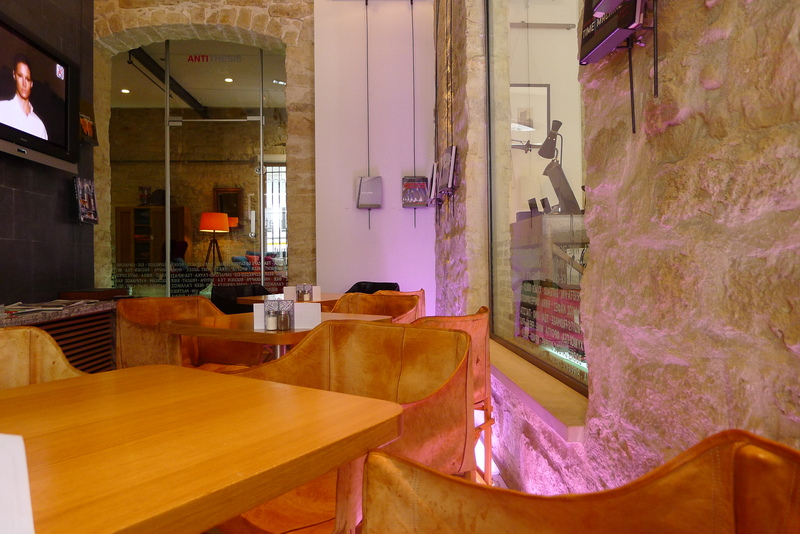 In the old town, right next to, (and part of), Thesis furniture shop, is a tiny café/snack bar, also one of the most stylish places in the city. One would expect nothing less from Vakis architects, designers and owners of Apokryfo retreat in Lofou village, clearly one of the best in the country. Antithesis serves only salads, a couple of tarts and pies (like spinach and feta pie), a couple of toasts (including the traditional lountza/halloumi) and fantastic sweets, (like traditional Palouze-grape jelly or halvas with almonds). The variety is small, but it fits the purpose of a quick snack bar with fantastic quality food. The prices are very fair at around 4EUR for toasts and 5EUR for salads.